With a prime location on the tropical shoreline of sunny Key West, the Hotel Key West offers guests the kind of relaxing resort atmosphere, warm hospitality and thoughtful services that are sure to please business and leisure travelers alike. Rooms > Each of the deluxe guest rooms and suites at the Hotel Key West overlooks either the Gulf of Mexico or the hotel's lush swimming pool complex. Rooms at the Hotel Key West feature such welcome amenities as refrigerators, data ports, safes, cable TV, coffee makers, hair dryers and ironing boards. Services > When it's time to relax, guests at the Hotel Key West can enjoy an outdoor swimming pool surrounded by sun decks and lush tropical greenery. Other amenities at the Hotel Key West include concierge service, room service and free parking. Groups & Meetings > The Hotel Key West, an ideal choice for meetings or social events for up to 100 people, offers a 1,200-square-foot meeting room and expert services provided by an experienced meetings staff. 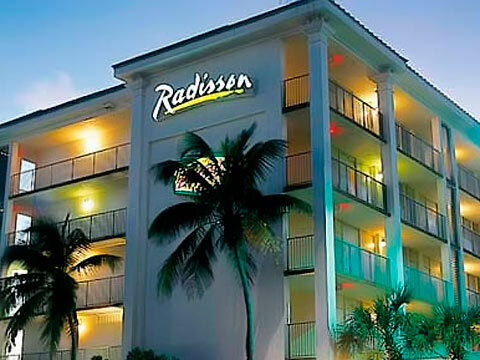 Dining > The Hotel Key West features American-style dining available 14 hours a day at an on-site Denny's Restaurant. Guests at the Hotel Key West will also find casual poolside dining at Splash and beverage service at the Lobby bar. Local Area > Close to the famed beaches of Key West, the Hotel Key West is also convenient to golf, tennis, watersports and Key West's charming Old Town. The many attractions near the Hotel Key West include the Key West Shipwreck Museum, Audubon House and Tropical Gardens, Mel Fisher Maritime Museum, Conch Tour Train, Discovery Glass Bottom Boat and many others.